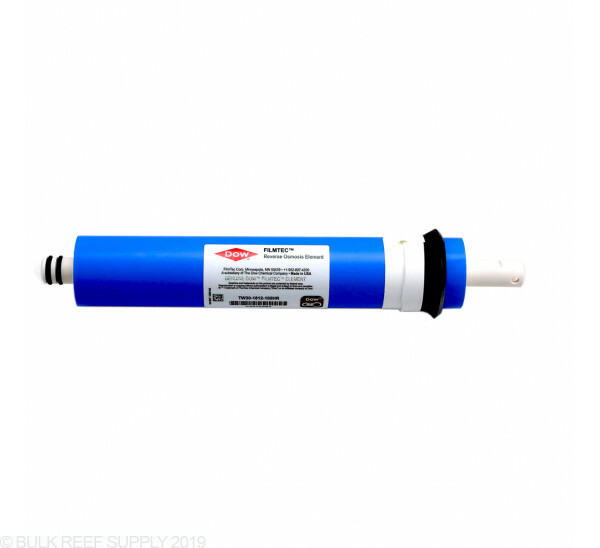 DOW Filmtec 100 GPD membrane features a 98% rejection rate at 50 PSI which makes it the most commonly used 100 GPD membrane used in the aquarium industry. If you require slightly faster water production and have good water pressure this is one of the better options. *Permeate flow specifications are based on 250 mg/L NaCl solution at 50 psi (3.4 bar) inlet pressure, 77°F (25°C), 15% recovery after 24 hours. Individual element flux may vary ±20%. I have very hard water starting at over 530. I purchased 2 of these for my duel membrane filter and getting 26 ppm out to my di resin which is awesome. my last off brand membrane was getting 86 at best so this will greatly improve my di resin life. I should have done this a LONG time ago! Saves water and time! I purchased this to use in conjunction with the BRS 800 mL Flow Restrictor ( I purchased previously). I have a Coralife Pure-Flo II 50GPD 4 stage RO System that has a 1/4" Aquatec 8800 Booster Pump Kit installed on it. I wanted to increase my throughput though and this did the job. I needed to remove the exiting flow restrictor that I discovered was located in the 90 degree output elbow of my system and replace it with an 1/8" MPT to 1/4" push to connect elbow. My throughput has dropped from 30 minutes to 18 minutes (2 1/2 gal. jug). I'm glad it worked and thanks to BRS for carrying what I needed for my upgrade. This replaced a 150 GPD RO membrane that I previous had. I had bought the unit used from someone else and I was going thru DI resin so fast it wasnt even funny. Changed out my RO membrane with this one and its working great! I have just concluded a build up of my own design system. A Staged 2X100 GPD RO Membrane system and with the addition of a booster pump these unit are performing exceptionally well. 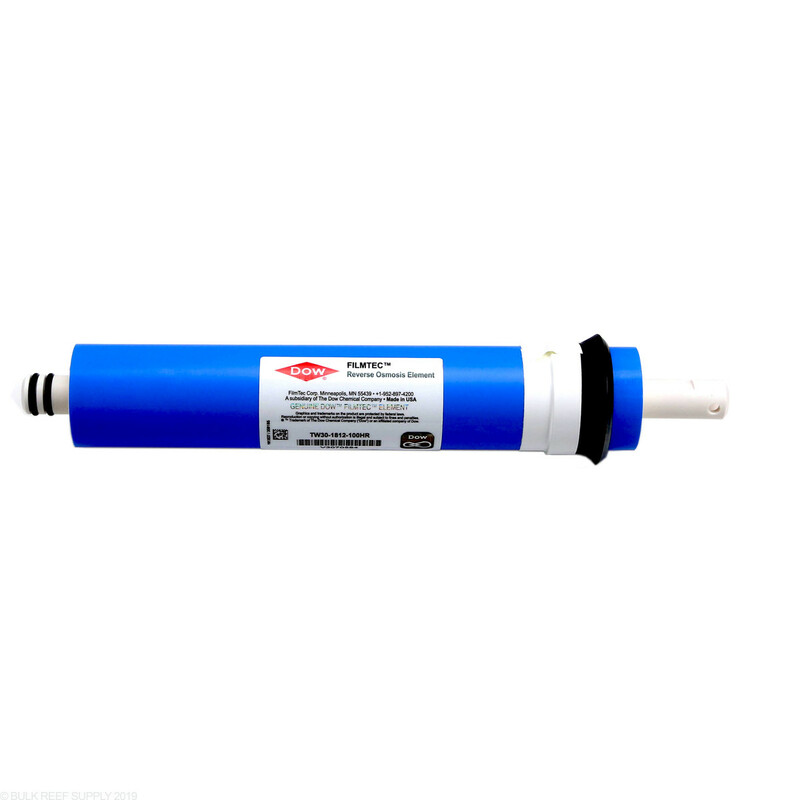 Can this 100 GPD membrane be used in other RO system? Such as the water general ro6100DINT? Thanks! Great question! Our RO membranes our standard 10" membranes, and should work with most 3rd party units. That said, compatibility cannot be guaranteed. Hey there, thanks for reaching out to us! These membranes will work in our systems, however you would need to change the flow restrictor. Also, the 100 GPD membranes will not have the same 99%-98% rejection rates as the 75 GPD membranes. You may notice higher TDS after the RO membrane, which can result in faster DI Resin consumption rates. Yes, it should be a direct replacement. Just as long as your membrane housing looking like the ones we use, the membranes should be interchangeable. Your 100 GPD filter is listed as TW30-1812-100HP. Dows sight has it listed as TW30-1812-100HR. What is the difference between the two? There is no difference in the membrane. It appears as if the HR vs HP may be a typo on our side. Feel free to let us know if you have any further questions! What modification/s (if any) to my system, 6 stage WS+, do I need to make if I replace both 75gpd memebranes with 100gpd. My system holds a steady pressure of 58-60 psi. Incoming TDS is light at only 120-135. To change up to 100gpd membranes you would just need to replace both of the membranes and the flow restrictor. Other than that the modifications should be almost non-existent. Thank you for reaching out to Bulk Reef Supply! That is a great question. We recommend your membrane be changed once every 3-5 years or so in most cases. I hope this qas helpful!